Clam chowder, blue hydrangeas and the Kennedys are all iconic symbols of Cape Cod. One of the most frequent questions we get is “how far away is the Kennedy compound? (It’s 3 miles from the Inn). Today, May 29, 2017, marks the 100th anniversary of President John F. Kennedy’s birth. And although the Kennedys had several homes, Cape Cod was where their hearts lived. The Kennedy clan has lived in Hyannisport, a sleepy seaside village, for 90 years. JFK’s presidential campaign was launched from Cape Cod and he used the compound as his campaign base. The entire Kennedy family spent election day 1960 here and JFK gave his victory speech in Hyannis. President Kennedy was successful in passing legislation for the Cape Cod National Seashore. This protected area includes more than 40,000 acres of forest, marshland, bogs and salt ponds along with nearly 50 miles of untouched beach. JFK frequented Four Seas Ice Cream (a stone’s throw from the Long Dell Inn) and his favorite flavors were vanilla and peach. 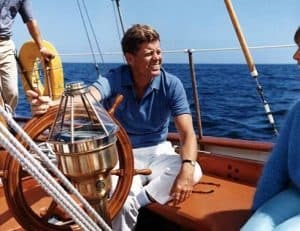 The President enjoyed golfing at the Hyannis Port Club (where he would call to schedule his own tee times) but his true love was sailing the waters of Cape Cod. To commemorate the centennial of his birthday, there are many scheduled celebrations on the Cape. 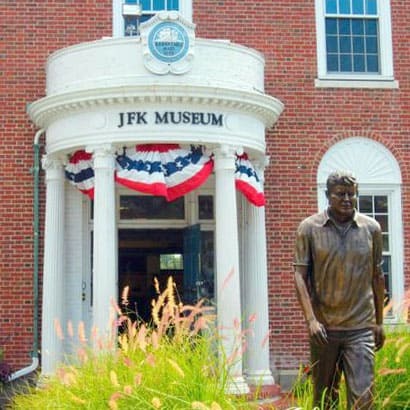 Today we will attend a special program at the John F. Kennedy Museum (jfkhyannismusuem.org) where they will be unveiling a new exhibit and then get a bite a eat. Some local restaurants will be celebrating with themed cocktails and special menu items. The Kennedy legacy continues to be intertwined with Cape Cod. For information on the Kennedy Legacy Trail, please click on the following link (kennedylegacytrail.com).